That came from my wife last week. I probably could have come up with a better adjective. What I couldn’t do though, and this still bothers me for some reason, was identify with that label. To me, writer, implies a level of professionalism and accomplishment, at least as far my own work is concerned. It’s not that I object to anyone who can identify themselves with that label. In fact, I wish I could bring myself to say: Hello, I’m a writer. I’m just not there yet. I don’t have anything in a state where I could justify it. Normally, the screaming child part of me eventually shuts up so that I can fix what’s wrong, and the part of me fantasizing about being a professional writer becomes humble so I can focus on improvement. However, this identification thing is causing a problem. On one hand, who cares about being labeled a writer, if you enjoy doing it, then it doesn’t matter what you’re called. Well, I suppose I do care, and I care because a failure to associate with the label is a symptom of not taking myself seriously. Except for the neck, and electronics, I designed and made this. It is my second attempt at making a musical instrument, the first was from a kit. 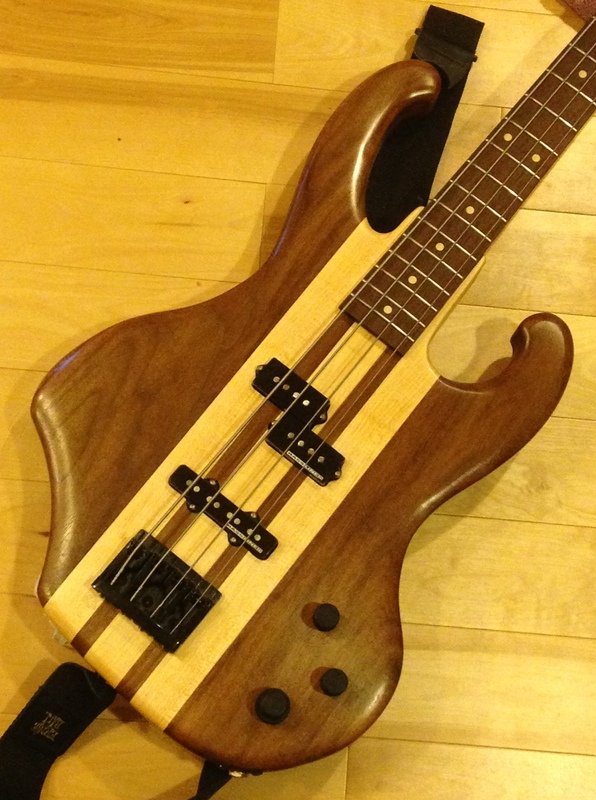 I am not a luthier, nor am I a particularly fine woodworker, but this thing sounds pimp, and I am still completely unsatisfied with it. That said, I’m not going to go into the odd details I hate that no one will ever notice. I spend at least an hour a night writing, and many more hours discussing plot, characters, setting, and so on with my wife and anyone else who’s foolish enough to listen. On those days I commute to work, much of that drive is spent thinking about my story. Not only that, when I get to a bit of story containing details I’m unfamiliar with, I start researching. On one occasion, I was at the table with a bit of string and my map. “What the hell are you doing there?” My wife asked. It was pretty obvious to me. I was doing a rough measurement of a road to make sure the the distances and travel times I had were plausible. So, with all of that effort, shouldn’t I be taking myself seriously? After all, I want others to. If I write my book and publish it, it’ll be hard to convince folks it’s a good read, if I haven’t even convinced myself. Just one more thing to work on I suppose. 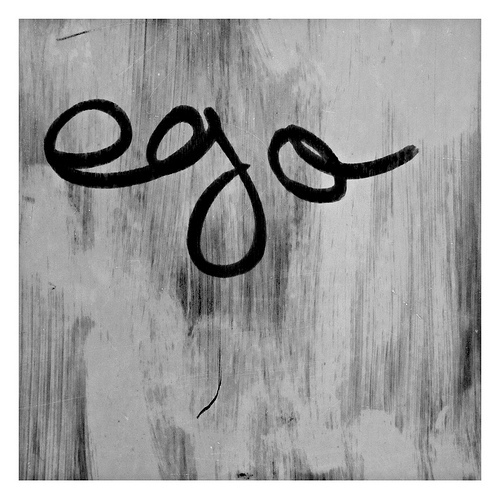 This entry was posted in writing, writing process and tagged being an aspiring writer, ego, perfectionism, problems of an aspiring writer, writers ego. That’s a really sweet looking bass! It’s something I was harping on – relativism. Who is to say you aren’t a writer? You write, and that makes you a writer. It’s the adjectives they attach to the writer thing that probably matter to you. Being published doesn’t mean you’re good- the Amazon Slush Pile of gorey manuscripts is proof of that. It’s more… did you do what your readers want? And then there’s marketing. For the nonce, though, you’re a writer. The criteria you attach to it are all extras. I’m not sure there’s much value to the term “writer.” It’s thrown around pretty liberally these days, and anyone with half a blog can claim to be a writer. I guess the proof is are you making money at it? Isn’t that the gist of the matter? Thanks for the compliment on the bass. I’m not totally thrilled with some of the finish, and a few odd-bits, but it really does sound good, and it weighs a ton. One day when (if?) I do make money at writing, I might feel better about the label, but your right, it is all relative isn’t it. I like Kristin’s content because she builds up and encourages, and this is a discouraging process in some ways. Anyway, the point was that if you’re training to be a lawyer, it’s pre-law. If it’s to be a Doctor, it’s pre-med. You’re not really a pre-writer: at what point does your craft become valid? When you publish a book? When the book makes $1000 in sales? 10,000? 100,000? You are a writer because you picked up a keyboard and began to write. You’re getting close to finishing a novel, and you have another in the planning stages, and this is very good considering you don’t start getting traction in publishing until your third book. So, you’re locked in, mister. You HAVE to keep going to make anything out of this- there’s a trilogy to write. You mean to tell me that you didn’t scan the map, drop it into a GIS program, geo-reference it, and get precise measurements (i.e., repeatable measurements; accuracy isn’t entirely relevant in fiction)?! Well, of course I would have done, except I don’t happen to have a GIS license, so I had to hack it. I did consider developing a fantasy world GIS type program to do this, and still haven’t ruled it out.